One of the most beautiful features of the traditional Ambrosian Rite is its unique manner of celebrating the Mass of Holy Thursday, which includes a special form of the Canon used only on that day. 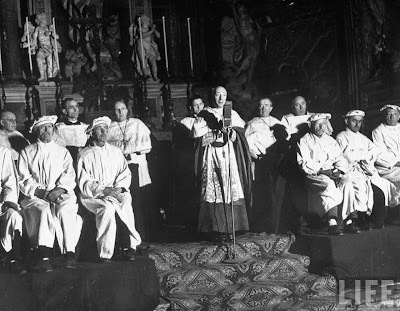 The Mass takes place ‘inter Vesperas – in the midst of Vespers’, although the Vespers in question are very much simplified, relative to the normal form. In fact, the Divine Office of the entire Milanese Holy Week is unusually austere; among other things, the Magnificat is omitted at Vespers, and the Benedictus at Lauds, as a sign of mourning over the death of the Savior. The rite begins with the regular lucernarium, a responsory originally to be sung during the lighting of candles and lanterns in the church. This is followed by a hymn, and another responsory called the “responsorium in choro”; in the Duomo itself, this chant is to be sung by the archbishop. A reader then sings the entire book of Jonah, a custom which, as Nicola de’ Grandi has noted before, is attested in the writings of St Ambrose himself; this is followed by a psalmellus, the Ambrosian equivalent of a gradual. The Mass then begins without an introductory chant, (the Ambrosian Rite has no Kyrie), starting from the collect, the same that of the Roman Rite; the epistle which follows is of course St Paul’s account of the institution of the Holy Eucharist and the Sacrifice of the Mass from the First Epistle to the Corinthians, 11, 20-34, which is read in the Roman Rite at both Mass and Tenebrae. There follows a cantus, the Ambrosian equivalent of a tract; its text is taken partly from the reading of the Passion according to St. Matthew which follows, (chapter 26, 17-75), and partly from St. Luke 22, 47-48. You are come out as it were to a robber with swords to apprehend me. Daily I was with you, teaching in the temple, and you laid not hands on me, and behold you hand me over to be crucified. V. As He yet spoke, behold a crowd, and he that was called Judas came, and drew near to Jesus to kiss him. And Jesus said to him: Judas, dost thou betray the Son of man with a kiss to be crucified? The Mass continues as normal, with a few modifications similar to those of the traditional Roman Rite. The normal antiphon “after the Gospel” is sung; its text is taken with slight modifications from the Byzantine Rite, which on this same day sings these words in the place of the Cherubic hymn at the Divine Liturgy. Thou receivest me today, Son of God, as a partaker of Thy wondrous Supper. For I will not reveal this mystery to Thy enemies; I will not I give Thee a kiss as did Judas; but as the thief, confessing to Thee: remember me, O Lord, in Thy kingdom. In accordance with the very ancient custom that the Kiss of Peace is not given on Holy Thursday, since it was the sign by which Judas betrayed the Lord, the deacon does not sing “Pacem habete” after laying the corporal on the altar, is as usually done in the Ambrosian Rite. The prayer “over the Offering” is the same as the Roman Secret; the Mass has a proper preface, as do most Masses in the Ambrosian Rite. Truly it is worthy and just etc. … Through Christ our Lord. Who though He was God in heaven, descended unto the earth to cancel the sins of men; and He that had come to liberate the human race, was sold in an unlawful purchase by His servant, like a debtor and a guilty man, even the Lord; and He that judgeth the Angels, was set in the judgment of man, that He might deliver from death man, whom He Himself had made. And therefore with the Angels etc. Communicating, and celebrating the most sacred day, on which Our Lord, Jesus Christ, was betrayed. Thou, o Lord, didst command us to be partakers of Thy Son, sharers of Thy kingdom, dwellers in Paradise, companions of the Angels; ever provided we keep the sacraments of the heavenly army with pure and undefiled faith. And what may we not hope of Thy mercy, we who received so great a gift, that we might merit to offer Thee such a Victim, namely, the Body and Blood of Our Lord, Jesus Christ? Who for the redemption of the world gave himself up to that holy and venerable Passion; Who instituting the form of the perennial sacrifice of salvation, first offered Himself as the Victim, and first taught that It be offered. But also venerating the memory etc. The words “keep the sacraments of the heavenly army – caelestis militae sacramenta servemus” refer to a common pre-Christian sense of the Latin word “sacramentum – a military oath of allegiance”. The Hanc igitur is not so much interpolated as completely rewritten. We therefore beseech thee, o Lord, graciously attend to this offering, which we make to Thee because of the day of the Lord’s Supper, on which Our Lord, Jesus Christ, Thy Son, instituted the rite of sacrifice in the New Covenant, when He transformed the bread and wine, which Melchisedech the priest had offered as a prefiguration of the mystery that was to come, into the sacrament of His Body and Blood; and so for the course of many years, in health and safety may we merit to offer our gifts to the Thee, o Lord; and may Thou order our days in Thy peace etc. Who on the day before He suffered for our salvation and that of all men, that is, on this day, reclining in the midst of His disciples and taking bread etc. The rest of the Canon is said as normal; however, after the Nobis quoque, there follows a lengthy addition unique to the Ambrosian Rite. We do these things, we celebrate these thing, o Lord, keeping Thy commandments: and at this inviolable communion, by the very fact that we receive the Body of the Lord, we also announce his death. But it belongeth to Thee, almighty Father, to send now Thy only begotten Son, whom Thou didst send willingly to them that sought Him not. Who though Thou art infinite and unknowable, didst also beget of Thee God infinite and unknowable; so that Thou may now grant His Body unto our salvation, by whose Passion Thou didst grant redemption to the human race. Through the same. This is the Body, which shall be given up for you: this Chalice of the New Covenant is in My Blood, sayeth the Lord. As often as you shall receive these things, do this in memory of Me. The Lord’s Prayer is then preceded by a special formula of introduction used only on this day, in place of the usual formula common to the Roman and Milanese rites. It is His commandment, o Lord, which we follow, in Whose presence we now ask Thee. Give to the sacrifice its Author, that the faith of the matter may be fulfilled in the loftiness of the mystery; so that as we carry out the truth of the heavenly sacrifice, so we may draw in the truth of the Lord’s Body and Blood. Through the same Christ Our Lord, saying: Our Father etc. The Transitory, the Ambrosian communion antiphon, also refers to the Passion Gospel of Matthew 26. My soul is sorrowful even unto death: stay you here, and watch with me. Now you shall see the crowd that surroundeth me, and take flight, and I will go to be immolated for ye. The Post-Communion prayer is different from that of the Roman Rite. Lord, our God, grant in Thy mercy; that we who have received the Body and Blood of Thy only begotten Son may be set apart from the blindness of the faithless disciple, we who confess and worship Christ our Lord as true God and true man. Who liveth etc. As in the Roman Rite, the Blessed Sacrament is taken to the Altar of Repose in solemn procession at the end of the Mass; afterwards, the end of vespers is sung. This consists of psalm 69, sung together with the two psalms 133 and 116 added to it, sung with a single doxology, according to a common custom of the Ambrosian Rite on feasts. The rite then concludes with four prayers, the Magnificat being omitted as noted above.